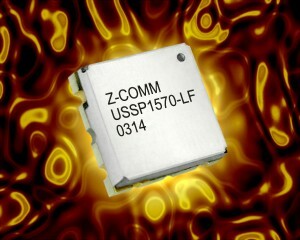 VCO: USSP1570-LF Features Ultra Compact Size and Low Phase Noise | Z-Communications, Inc.
Z-Communications, Inc. announces a new RoHS compliant VCO (Voltage Controlled Oscillator) model USSP1570-LF in the L-band. The USSP1570-LF operates from 1540 to 1600 MHz with the narrow tuning voltage range of 0.5 to 2.5 Vdc. This miniaturized VCO features phase noise of -90 dBc/Hz @ 10 kHz offset while operating off a 2.7 Vdc supply and drawing a mere 6 mA of current. The USSP1570-LF provides the end user an output power of -1±3 dBm into a 50Ω load while operating over the industrial temperature range of -40 to 85º C. This robust VCO suppresses the second harmonic to better than -25 dBc and covers the frequency range with a tuning linearity of better than 1.1:1. The USSP1570-LF comes in Z-Comm’s standard USSP package measuring only 0.2 in. x 0.2 in. x 0.07 in. It is available in tape and reel packaging for production requirements making it ideal for automated surface mount assembly and reflow. The USSP1570-LF is well suited for portable radio and mobile satellite communication applications that require low power consumption as well as low phase noise.